Both Android L and iOS 8 look impressive, but how do they compare? The battle for mobile's soul is raging and there are only two heavyweight platform contenders. Google's Android and Apple's iOS are getting better (and more similar) with every passing year. 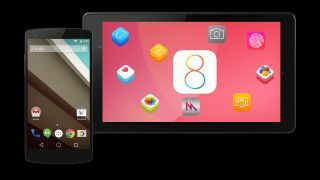 The latest incarnations, Android L and iOS 8, made their entrances at developer conferences, WWDC and Google I/O. Let's take a look at how they compare and work out whether Apple and Google are treading their own paths or starting to converge. It includes a familiarly sparse aesthetic with bold colours and a new typography. There are lots more animations for touch feedback and transitions between apps, there's more of a 3D feel with shadows, and a nested scrolling effect that slots UI elements out of the way when you don't need them. Apple killed skeuomorphism with iOS 7, so major surgery wasn't deemed necessary for iOS 8 and it retains the same clean and uncluttered look - Android L seems to take a little from iOS 6 (with the more realistic designs) and some from iOS 8, following the trend for flatter designs. The iOS 8 SDK contains more than 4,000 new APIs for developers, but apparently the Android L SDK trumps it with more than 5,000. Of course, everything depends on what those APIs actually have to offer, but Android L also brings support for 64-bit processors, which we saw roll out in iOS 7. Google has finally dumped Dalvik and made ART (Android RunTime) the new engine, which should offer a significant speed boost. It uses AOT (Ahead-of-Time) instead of JIT (Just-in-Time) compiling, which improves a lot of elements, but among the primary benefits are general performance and battery life. Apple switched to the Swift programming language for iOS 8 and OS X development, which is intended to safeguard against errors and offer improved performance for developers when coding for iPhones and iPads. These are tools that will give developers the chance to make apps with fewer bugs, so we're waiting to hear the verdict on which will be the platform that has the best changes. The rival platforms are creeping ever closer in terms of notifications. Apple added interactive notifications to the lockscreen with iOS 8 and made them less intrusive with pop-ups at the top of the screen in apps. Google has done much the same in Android L with notifications on the lockscreen that can carry you straight into the apps, and pop-ups at the top of the screen when you're already doing something. They're also newly ordered by relevance, based on your past activity. For the 15% of people using PINs or pattern locks, Google has added a new authentication system that can determine when you're holding your phone using location awareness and attached Bluetooth devices and unlock it automatically for you. It seems pretty likely that Apple will do the same with the iWatch when it (probably) launches later in the year, and along with TouchID shows the Cupertino brand is looking as much as anyone at ways of making your body the ultimate password. The Android Wear platform is rolling out for developers and the LG G Watch and Samsung Gear Live are available to order now. Apps on your Android device will automatically download and update themselves on any Android Wear device that you link. They can also sync between devices, so you can follow a recipe on your watch and on your smartphone at the same time - which is pretty neat when you can simply tap the screen and start a timer if the recipe called for it. Google looks like it's rolling out dedicated Android Wear apps too - which appeared on the Play Store then were quickly pulled - so it shows that the Big G thinks that wearables are the future (we've not even talked about Glass either). Apple has yet to announce an iWatch, but the updated Health app and the HealthKit API for iOS 8 are designed to make it easier to extract fitness and health data, and the fruity brand's new wrist-dweller is set to pack all manner of sensors as it looks to become the ultimate device to show you just how fit and healthy you are. Android L offers greater control over battery life with new enhancements and modes that enable users to fine tune how much juice apps can guzzle down. 'Project Volta' goes into depth on where your battery is draining and a baked in battery saver mode can make tweaks to extend its life. This saving mode is something we've seen a lot of Android OEMs adding in their UIs already though, and we'd have loved to see an 'extreme battery saving mode' like HTC and Samsung have done to really eke out the battery life. Apple is lagging behind a little, but iOS 8 will finally bring a Battery Usage screen that actually shows which apps are leeching the most power when running and on standby, so you can make informed decisions with your settings. Google's Open Automotive Alliance is growing fast with 40 new partners since we last heard about it. Android Auto will allow you to plug in your Android device and get a simplified interface with voice controls. You can easily browse navigation and entertainment content, as well as take calls and messages. Once the device is connected you use the car controls, but the software remains on the phone. It looks very similar to Apple's CarPlay, in form and function, and it will be interesting to see which platform the big manufacturers favour. Google and Apple are both pushing forward as quickly as possible and we'll see both Android Auto and CarPlay models on the road later this year. Android L will allow people to unlock their Chrome OS laptop automatically when their Android device is close. There's also a sharing of notifications, so your Chromebook can mirror your Android device notifications and warn you when the phone battery is low. There's even some app crossover as some big name Android apps like Evernote, Flipboard, and Vine appear on Chrome OS. Apple has done something similar with iOS 8 and the forthcoming OS X Yosemite with its Handoff feature, which allows you to pick up activities in apps on your laptop or desktop and start where you left off on your iPhone. You can also handle calls and messages from your iPhone on your Mac too. There are plenty of other juicy features and updates in both platforms. Android L also offers greater integration with the Chrome browser, tabs now appear right next to apps when you tap the multitasking button, and you can dive straight into installed apps from browser results. Apple opened up its Touch ID authentication for more apps, unveiled a time-lapse camera mode, and beefed up messaging options with location sharing and self-destructing messages. We'll keep you posted on everything else Android L and iOS 8 have to offer as we find it. Developers can get their hands on Android L and iOS 8 right now, but we'll have to wait a little longer for a proper release date. Our best guess is that iOS 8 will land on the new iPhone, probably in September, and will appear on older devices when the iPhone 6 goes on sale. Android L is likely to be a month or two later, probably on a new Nexus device - we're hearing stuff about the Nexus 6 and Nexus 8, and given Android L will be here in the 'Fall', the likelihood is we'll be getting new Nexii, complete with the L treatment, in time for the Christmas period. We're still waiting on Windows Phone 9.